Ok, so you guys and gals know that I'm not normally a big fan of Christian fiction, right? I probably sound like a broken record around here because I keep saying that Christian fiction is generally unbelievable, poorly written, blah, blah, blah. I honestly think this is a huge shame because Christians should be writing in stellar fashion. Yet they do not for some strange reason which I cannot understand. I find it frustrating that so much of it is published when I feel like so little of it is worth reading. 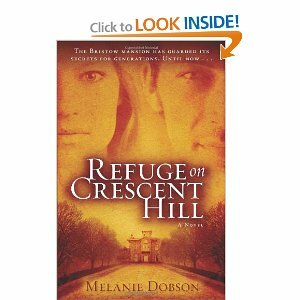 Then came Refuge on Crescent Hill: A Novel ,by Melanie Dobson. I'm as excited about this one as I was about The Silent Gift by Michael Landon, Jr. (Click on the title to read my review of that one.) Hands down thrilling good fun. And unfortunately I picked it up and started reading it on a really busy day. Which meant I read it as fast and furiously as I possibly could in any spare minute that I could find but it still took me two days. Two days of bliss and suspenseful agony all at the same time! Don't you just love it when a book manages to wrap you up in that manner? This book reminds me why I like to read: for the pure, unadulterated pleasure of curling up with a fantastic story and becoming swept away in another person's world. To give you a basic idea of what this book is about - Camden Bristow is a jobless and homeless photographer when she decides to return to visit her grandmother who lives in Etherton, Ohio. Her grandmother lives in an old mansion known as Crescent Hill. Camden arrives to discover some shocking and life changing news and throughout the remainder of the book, a mystery surrounding Crescent Hill slowly begins to unravel. I don't want to provide any spoilers so that's all I'm going to say about the plot. This book was just fun. With eager anticipation I breezed through the pages, wondering what would happen next. Sometimes I guessed right and sometimes I guessed wrong. I had a good time. This is really not so much of a review as a "rave" that I almost feel ridiculous writing this up! I know JUST the friend I'm going to pass this one off to because I know she'll absolutely love it. This is exactly the type of book that you want to read with a friend so that you can talk about the coolness of it. Refuge on Crescent Hill is a blast of an experience. Ok, running out of adjectives but...happiness rules the day with this one! In the meantime, I'm excessively happy with Melanie Dobson and have added her other titles to my own Amazon wishlist for future reading pleasures. If this is her usual style - I'm all about Melanie Dobson books. Hook, line and sinker! Thanks, Kregel Publications, first of all for publishing this book and then for sending me a copy to read. Sounds like a fun escape for a hot summer day. Thanks to your "rave" review, this one is going on my to-be-read list! I adore Christian fiction but I know what you mean about finding it lacking. You have to wade through some real stinkers before you find the jewels. This sounds like a great one! I totally agree with Mary that you have to wade through to find the "jewels." Wow! I am with you on Christian fiction almost always being lame, but your review is so positive that I am going to add this to my TBR list!